The CNMI plunged early into the region’s dry summer season with a string of wildland fire in the past few weeks, heralding the islands’ transition into dry season. This was affirmed by the Department of Fire and Emergency Medical Services in a Facebook post yesterday, which said the CNMI’s dry season has officially begun. The department’s office on Tinian advises that a wildland fire at the Kastiyu Plateau, which started two days ago, does not pose an immediate threat to any structures or residents. “We will continue to monitor its progress and movement,” DFEMS said in its Facebook page. The Tinian department strongly advises the public to stay away from the Kastiyu area. After months of continuous rain and what seemed to be an endless cycle of storms, typhoons, and tropical disturbances, the CNMI has transitioned into the dry season in January but with it came an increase in a number of wildland fires. The dry season is expected to last until May. 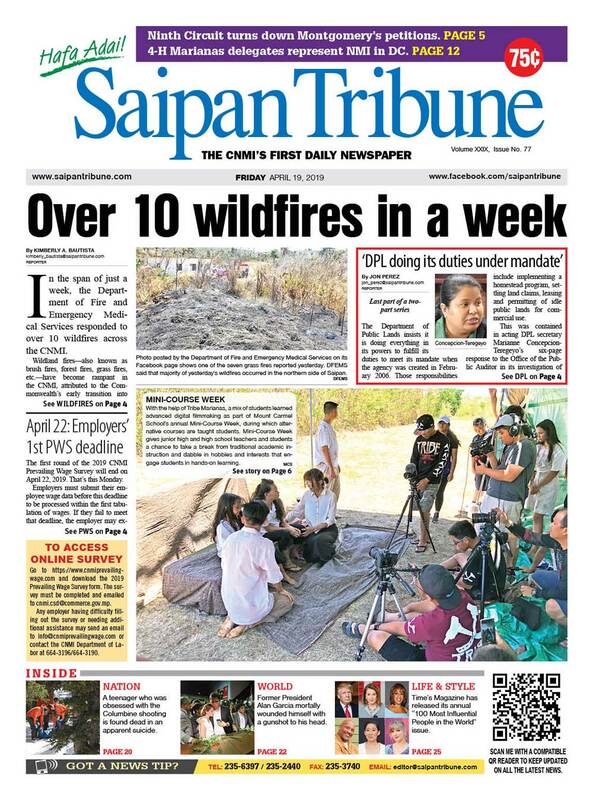 In the past month, the Department of Fire and Emergency Medical Services has fought and contained over seven wildland fires on the islands of Saipan and Tinian. Fortunately, according to DFEMS spokesperson Derek Gersonde, the CNMI has a team of seasoned wildland fire fighters. Gersonde explains that wildland fires are fought differently than structure fires, which are primarily extinguished with water. Wildland firefighters, however, are trained to use tools such as rakes, shovels, etc., to contain wildland fires from extending further out and to make the right calls in whether the fire should be put out with water or if it’s safe to let the fire continue to burn because it won’t harm crops or structures and is on the path to dying out on its own. Wildland fires are a relatively normal occurrence during the islands’ dry season. Individuals are encouraged not to throw cigarette or cigar butts on the ground or out of a vehicle. Do not burn trash, leaves, or brush outdoors, without proper supervision. Individuals should employ a 30 feet “safety zone” surrounding the home by clearing away loose grass, leaves, etc. away from the home, especially those living in a woodland area. If not using a storage shed to store firewood, make sure firewood is stacked at least 20 feet. Dried leaves should be raked, dead forestation limbs should be cut off, grass should be cut regularly, and dead branches that have extended over roofs should be remove. Vehicle operators should avoid parking cars, trucks or recreational vehicles on dry grass or brush because exhaust systems on vehicles can reach a temperature of more than 1,000 degrees and it only takes about 500 degrees to start a brush fire in the summer. Maintain a 10-foot area that is free of brush and shrubbery around barbeque grills and propane tanks. Do not leave a grill unattended and when finished, place ashes in a bucket and soak them in water until completely cooled. Keep a shovel, bucket of water, fire extinguisher, or other fire suppression tools on hand in case of emergency. Lastly, brief children of the importance of not playing with fire, especially in grassy areas because fire can spread quickly and children need to be informed of the potential threat. For more information or tips, feel free to call the department at 664-9004/3 or visit the nearest DFEMS station.